Background: Asenapine is an anti-psychotic agent approved by the US-FDA for treatment of acute schizophrenia and manic or bipolar I disorder in adults. It is poorly absorbed when administered orally, hence exhibits poor oral bioavailability, which limits its use in clinical practice. Objective: Enhancement in solubility of asenapine through complexation with three different cyclodextrins, viz. βCD, HPβCD and sulphobutylether-βCD (Captisol®) was attempted and compared due to its poor bioavailability. Method: Kneading method was used for preparation of inclusion complexes which were characterized by FTIR, DSC, and XRD methods. Extent of binding and stability of the 1:1 inclusion complexes were evaluated by molecular modelling and phase solubility studies. Pharmacokinetic studies were also carried out of these inclusion complexes. Results: Captisol® complex was the most stable amongst all complexes showing 4.9 times solubility enhancement of asenapine and 96% drug release at the end of 60 min, whereas asenapine maleate (uncomplexed drug) was released completely at the end of 120min. The Cmax and AUC values of Captisol® asenapine complex (AS-Captisol complex) were 2.8 and 2.3 times higher than the uncomplexed drug. 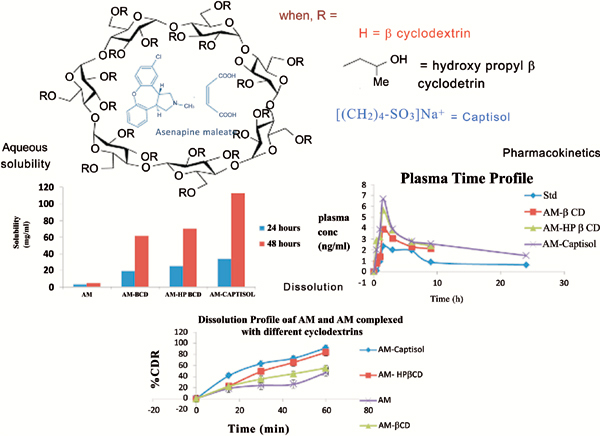 Conclusion: This study thus demonstrated that Captisol® inclusion complex is an effective strategy for solubility and bioavailability enhancement of asenapine. Keywords: Asenapine maleate, bioavailability, Captisol®, cyclodextrin, MM-PBSA, molecular dynamics, solubility enhancement. Keywords:Asenapine maleate, bioavailability, Captisol®, cyclodextrin, MM-PBSA, molecular dynamics, solubility enhancement. Abstract:Background: Asenapine is an anti-psychotic agent approved by the US-FDA for treatment of acute schizophrenia and manic or bipolar I disorder in adults. It is poorly absorbed when administered orally, hence exhibits poor oral bioavailability, which limits its use in clinical practice.